Lalaji Memorial Omega International School inaugurated its very own Cricket Ground within its expansive campus. The Cricket Ground has been inaugurated by Mr. K.S. Viswanathan, the CEO of Chennai Super Kings (CSK) and Special Guest Mr.V. Ramesh, Vice President, TNCA & Secretary, KDCA. The state-of-the-art cricket ground has a lush green grass outfield and a matting wicket and looks to host approved matches by TNCA and KDCA apart from other recognised tournaments. The ground is equipped with eight practice wickets which consists of four matting wickets, 2 turf wickets and 2 concrete wickets. The magnificent ground is picturesque with clear views of the terrain speckled with enjoyable visits from feathered friends! Both Mr.Viswanathan and Mr. Ramesh heaped generous praise about the school and the facilities it offers students to excel in sports. 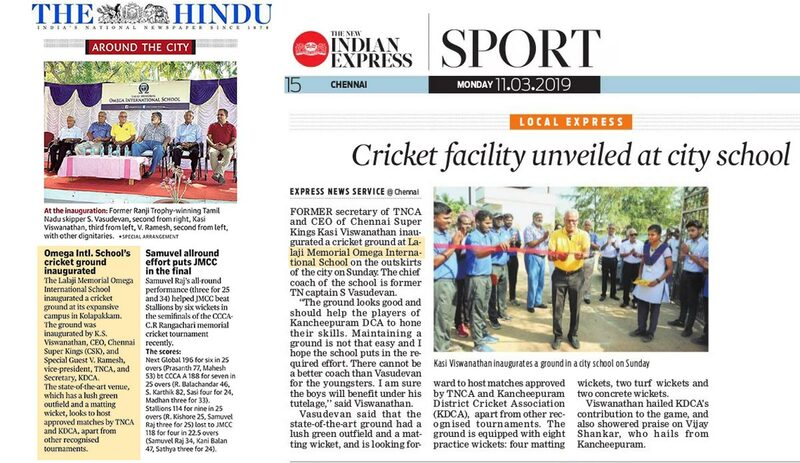 The Chief Guest also performed the honor of flipping the coin to begin the proceedings of the inaugural match on the swanky new ground between Brindavan CC (A first division Cricket Club from Kancheepuram District owned by the school) vs Team Omega. He further added that support from TNCA and CSK is in the cards and wishes for greater collaboration and success with the school’s new venture. Visit our facebook page for more photos from the very memorable day!